A bill that expands designated Wilderness and Wild and Scenic River corridors introduced. Congressman Norm Dicks and Senator Patty Murray recently introduced the Wild Olympics Wilderness & Wild and Scenic Rivers Act to permanently protect more than 126,500 acres of Olympic National Forest as wilderness and 19 rivers and their major tributaries, a total of 464 river miles, as Wild and Scenic Rivers. If enacted, the legislation would designate the first new wilderness on Olympic National Forest in nearly three decades and the first-ever protected wild and scenic rivers on the Olympic peninsula. 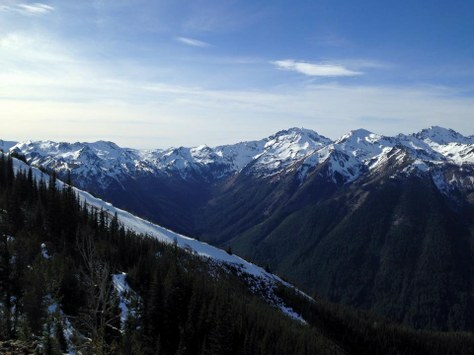 The bill would offer permanent protection to some outstanding backcountry destinations, including lands in the areas of Moonlight Dome, South Quinault Ridge, Rugged Ridge, and Lost Creek, as well as additions to existing wilderness areas including Buckhorn, The Brothers, Mt. Skokomish, Wonder Mountain and Colonel Bob Wildernesses. As active members of the Wild Olympics Campaign we are excited to see these efforts move forward. Learn more about the Wild Olympics Wilderness & Wild and Scenic Rivers Act will do, its benefits and economic impacts. Congressman Dicks and Senator Murray have worked tirelessly to craft this proposal. Please take a moment to send a personal letter to thank them for their work on the Wild Olympics Wilderness & Wild and Scenic Rivers Act. ContactCongressman Norm Dicks or Senator Patty Murray and let them know you support the Wild Olympics!